has put in place measures to ensure that adequate maize stocks are secured to guarantee both household and national food security, Lusaka Province Minister Japhen Mwakalombe has said. in place to ensure that all bogus people involved in the procurement or illegal exportation of maize from the country were dealt with by the law. to panic about food security. Government has put in place measures for stopping illegal exportation of maize and the Food Reserve Agency (FRA) has already procured some maize and is still procuring,’’ he said. As provincial minister he wanted to take it upon himself and have a chat with the law enforcement agency in making sure that in Lusaka no individual or a corporate body would be allowed to illegally take maize outside the country without documents or authority from the Ministry of Agriculture and that anyone found wanting should never be supported because that person was an enemy of the country. Mr Mwakalombe added that Government was working hard to see to it that the price of mealie-meal was going down and that the only way the commodity would be reduced was by having enough maize stocks in the country. “We will catch them, they are not smart. 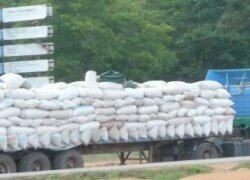 It is very unpatriotic for any Zambian to illegally export maize when it is the country’s staple food. It’s like taking away life of the people,’’ he said. The minister was speaking in line with the presidential directive that the current Minister of Agriculture Dora Siliya should ensure that no maize left the country illegally. He said he was keen to work hand in hand with the ministry to ensure that maize was safeguarded to curb illegal exporters. Mr Mwakalombe said Government was ready to sacrifice resources of other economic demands to secure enough food stocks for the province and other parts of the country.